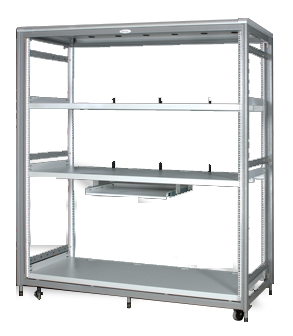 The Racks are tailor made to customer requirement and available in completely steel or aluminum & Steel composite.The Design is completely modular and CKD construction allow to fast and easy assembly at site. Rack subassembly powder coated with highest quality standards under stringent ISO 9001-2008 Manufacturing & Quality management system to ensure highest quality product. Generally these racks are preferred to use as open frame. To meet some special requirement NetRack offers front Doors, Back Doors, Side Panels as option.